Ho Chi Minh City government officials handed down a decision Sunday aiming to make life easier for poor students during the upcoming school year as agencies and ministries prepare to battle rampant fraud. The city’s schools will provide free tuition fees and admission costs for schoolchildren from poor backgrounds during the upcoming school year, said Vice Chairman of the Ho Chi Minh City People’s Committee Nguyen Thanh Tai. The city is making an attempt to eradicate education fraud, affirming not to overlook what it considers poor conduct in the education system, he added. There are three main ways to prevent school admission bribery scams. The first is to close gifted secondary schools, which the city has already done. The second is to improve education in rural areas making it equal with city schools. And last but lot least, parents should stop pushing their children to get into renowned schools, as the competition for the limited space in such schools has caused recent bribery scandals. One delegate suggested that the annual conclusion of schools evaluation should be made public so that parents think about and select the best one for their children. The city is now in preparing to welcome over 1,2 million schoolchildren and over 60,000 teachers for the upcoming school year. In more detail, about 1,100 new classrooms have been put in operation, over 1,900 teachers have been recruited and over 300 are going to be employed in the near future. However, as many as 14 schools are not in completion yet while the new school year is going to open in 2 days. 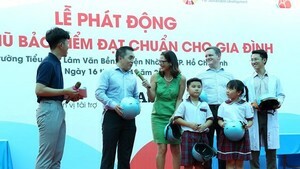 AIP, the Department of Education and Training, the Ho Chi Minh City Traffic Safety Committee and Abbott Company joint organized a lunch meeting for a project “Helmets for Families” 2019 in Lam Van Ben Primary School in Nha Be District of Ho Chi Minh City.